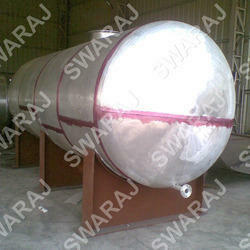 Prominent & Leading Manufacturer from Pune, we offer acetic acid storage tank, horizontal nitric acid storage tank and stainless steel storage tanks. We are identified as one of the most competent enterprises of this industry, engaged in offering a wide range of Acetic Acid Storage Tank. These products dealt in by us are manufactured using premium grade raw material and contemporary machines in conformity with set universally accepted norms of quality. In addition to this, our offered products are highly appreciated by our clients for their several qualitative features. 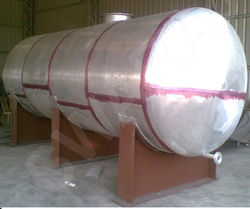 We offer a wide array of Horizontal Nitric Acid Storage Tank that is attentively manufactured using superior quality raw material and contemporary technology. Offered in numerous sizes, capacities and can also be customized as per the diversified requisites of the client. Used to store acids, these are known for their unmatched features. We are one of the leading manufacturers of Stainless Steel Storage Tanks & Aluminium Tanks required for Ordnance Factories, Pharmaceutical Industries, Chemical Industries, Sugar Industries, Distilleries & Liquor Plants etc. We have all type of facilities for fabrication of Aluminium & Stainless Steel like Heavy duty TIG Welding Machine, Plasma Cutting Machine, CO2 Machine, Bending Machine, Drill Machine. Looking for Aluminum Tank ?